This year: White Christmas the Broadway musical, Strawbery Banke skating rink, costumed holiday dining in Pitt Tavern, Figtree Kitchen cafe, The Nutcracker, and more! Make plans now for the perfect holiday visit! 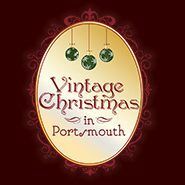 Now in its 11th year, Vintage Christmas in Portsmouth celebrates the winter, the warmth, the light, and our collective memories of holidays past. Presented by cultural anchors The Music Hall and Strawbery Banke Museum in the historic working seaport of Portsmouth, New Hampshire, this month-long city-wide event will once again offer the irresistible Candlelight Stroll that Strawbery Banke Museum has offered for over 30 years, and the Broadway production of Irving Berlin’s White Christmas at The Music Hall’s landmark 1878 Historic Theater presented in partnership with the Ogunquit Playhouse. Back by popular demand, the free Vintage Christmas trolley, courtesy of the City of Portsmouth. Cuddle up with a trolley ride through red-bricked Market Square in this elegant and delightful holiday downtown each Saturday and Sunday afternoon and evening for the first three weekends in December. Background According to Monte Bohanan, Director of Marketing for The Music Hall, “Settled in the early 1600s, Portsmouth is the perfect town for Vintage Christmas since it’s a charming blend of the contemporary and historical. Culture, history, food – it’s an intoxicating mix.” Beyond sponsoring the trolley, The City coordinates the Illuminated Holiday Parade and ceremonial tree lighting on the first Saturday, decorates the Welcome to Portsmouth signs and period streetlights with large wreaths, and collaborates with ProPortsmouth., Inc. to make First Night® Portsmouth (New Year’s Eve) a spectacular evening in the city (ice sculptures, fireworks, live music). Finally, the library and recreation department have holiday programs. Strawbery Banke Museum welcomes visitors to time travel through 300+ years of daily life in the waterfront neighborhood of Puddle Dock. Candlelight Stroll, one of the museum’s most treasured signature events, depicts December — and where historically appropriate, the holidays of Christmas and Hannukah — through the centuries. Candle lanterns light the dirt lanes, historic houses glow with hand-made decorations and costumed role players of all ages share their winter experiences with guests. A full program of musical performances and theatricals adds to the holiday spirit. Open House Weekends (December Weekends Fri-Sun)– Choose a Pickwick’s adventure this holiday season–Lady Pickwick’s, Pickwick’s Mercantile, Pickwick’s at the Banke or Deadwick’s Ethereal Emporium (Nov27). Browse our curious collections, delve back in time, and of course, enjoy our complimentary gift wrapping and food sampling as always. Celebrate the season with the most joyous of all merry-makers…The Pickwickians! Deadwick’s Ethereal Emporium– Will be re-opening November 27 (Black Friday) through Dec 24 with a new theme…stay tuned! Wonderful holiday fare is slated for The Music Hall’s two stages – the landmark Victorian 1878 theater and the contemporary Loft. Ragpickers Dream tells the stories of the holiday season in the intimate setting of the Loft, the Nutcracker makes its return, and the year rounds out with Comedy Central’s Juston McKinney’s Last Laugh 2015. The Ogunquit Playhouse at The Music Hall Series continues to bring Broadway to the historic port, with Irving Berlin’s White Christmas – happening December 9 – 20 in the Historic Theater. Figtree Kitchen cafe in the Tyco Visitors Center is open throughout Candlelight Stroll, serving a light menu of sandwiches, quiche, sweet and savory scones, specialized pastries and hot and cold beverages. At Discover Portsmouth– Discover Portsmouth celebrates Vintage Christmas in Portsmouth with the kickoff party Tuesday December 1, 2015 5-7pm when visitors will have the first look at the popular Gingerbread House Contest exhibit running until Christmas Eve in the first floor gallery. Created by local businesses, artists, families and kids, the gingerbread houses can be seen every day from 10am – 5pm with extended hours on Saturdays and Sundays until 8pm, and open for Art Round Town, Friday December 4 from 5-8pm. The exhibit is free and open to the public at Discover Portsmouth 10 Middle Street. Come see these magical creations and find holiday gifts in the Museum Shop! At Pickwicks- Pickwick’s at the Banke, complementing the museum with a shopping experience reflecting Portsmouth’s colonial maritime heritage. The store is located at 43 Atkinson Street (on the corner of Court and Atkinson) on the museum campus, and is open to the general public. No museum ticket is required to shop at Pickwick’s at the Banke. Described as a ‘magical space’ featuring local art, artisans and products; Pickwick’s at the Banke is designed to be a nostalgic space that’s accessible to a new generation. Pickwick’s management has earned a following by creating “an experience” for their guests. The merchandise, the atmosphere and the hospitality of the staff make shopping more than a pastime. Like Strawbery Banke itself, Pickwick’s at the Banke is about preserving Portsmouth heritage, historical role-playing and participating in a sort of time travel through 300 years in this Puddle Dock neighborhood. Pickwick’s will present a costumed historical dining experience in Strawbery Banke’s Pitt Tavern on the six nights of Candlelight Stroll.